When the fake remains of our earliest ancestor were unmasked for what they really were, shame was heaped on the research establishment. But exactly 100 years to the week that this extraordinary hoax was presented to the world, the Piltdown Man "fossils" are back in the lab and the subject of serious study. He was at hand for most of the major "discoveries" at the dig sites on the edge of Piltdown village. Most people believe his hand was responsible for planting the key faux specimens in local gravels. These included an ape-like jaw fragment, complete with molars and a canine tooth, some human-looking cranial parts, plus assorted stone tools and ancient mammal remains. Much of the haul was stained to reflect long-term burial in the gravels, to make the artefacts look as if they truly were many hundreds of thousands of years old. The collection was utter rubbish, of course: a mix of bones - some very modern - that had in a number of cases been crudely filed to give them the shape expected of an ancient human species. But although chemical testing finally exposed the fraud in 1953, there has always been some doubt over the culprit's true identity. Hence, the new battery of testing now under way, which aims to close the book on the remaining uncertainty, according to Prof Chris Stringer from London's Natural History Museum (NHM). "What we're trying to do is apply forensic level techniques to this material," he told the BBC World Service Discovery programme. "We're trying to find out how many kinds of staining techniques there were, how many methods of modification, how many specimens were used between all these assemblages. The more we narrow it down to one person, the more in my view it will point to Dawson's central involvement in the whole thing." DNA testing should determine whether the jaw fragment really was from an orangutan or some other kind of ape. Isotopic analysis could reveal the original locations from where some materials were sourced, since different regions of the world have characteristic isotopic compositions in their rocks and groundwater. There is a suspicion, for example, that the skull pieces were actually taken from an Egyptology collection. Radiocarbon dating will tell the team the precise ages of the artefacts. That jawbone is probably a few hundred years old at most, but the new science ought to be definitive. And spectroscopy should expose the chemistry of the staining fluids. If one "cocktail" is found to have been used to colour all the materials, it would hint strongly that a single perpetrator was at work, especially if that recipe was used at all dig sites. That is because only Dawson knew the location of the second site. Dr Matt Pope from University College London has even been back to the Piltdown gravels themselves. "We want to go back to the original records of the excavations, to follow the logic of Dawson and others involved and to see these deposits with modern archaeological and geological eyes," he told us. "This will give a better understanding of the context of the fraud. It will provide samples that allow us to do two very separate things. One will provide materials we can study to understand the material basis of the fraud itself. But also - and for me this is the most exciting thing as a human origins researcher - it can allow us to begin the systematic study of the genuine part of this hoax - the Ice Age gravels, their age, their significance and the genuine finds associated with them." And Prof Adrian Lister's research may well have identified the true origin of some of this material. "Fossils of the mastodon and the rhino are quite rare. There's really only one place where you can excavate remains of the mastodon species. It's a deposit in Suffolk called the Red Crag; and this deposit is between two and three million years old," the NHM researcher explained. "Even back then these species were recognized as being quite ancient, and that was quite deliberate because, not only, was it an attempt to make the site look real but also that the human remains were very old." You would be forgiven for thinking that the British scientific community would really have liked to pack the Piltdown specimens in a box and have them crushed. But the memory and interest is maintained, if for no other reason than the whole affair serves as a warning for how things can go horribly wrong. That said, it proves also the power of the scientific method ultimately to find the truth. Prevalent theories stand or fall in the face of constant questioning; and although it took 40 years to finally unmask the deceit, the Piltdown claims were looking ragged long before their eventual collapse because of truly compelling discoveries made elsewhere in the world. "People obviously have to keep their guard up when there is some new find," reflected Prof Stringer. "Sometimes, if something seems too good to be true, maybe it is too good to be true. And just because something fits your theories you shouldn't therefore lower your guard and believe it absolutely from the start; you have to assess how the find fits into the bigger pattern." 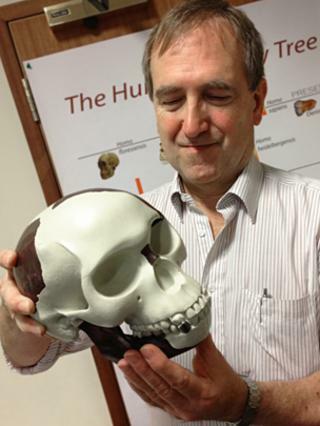 You can hear Jonathan Amos tell the story of Piltdown Man this week on the BBC World Service's Discovery programme, which is first broadcast on Monday at 1932. The Piltdown specimens will be on display at the Natural History Museum from Tuesday, in a special cabinet near to the dinosaurs gallery in the NHM's blue zone.